Newcomers to the Episcopal Church and/or Anglo-Catholic tradition (and even many who have been around for years) are often confused or amused by our language. We use many words, particularly in the context of worship, that are obscure. Below in alphabetical order is an extensive though not exhaustive list. Acclamation. In worship terms, this normally refers to the bidding used by the celebrant at the formal beginning of the mass: e.g. “Blessed be God, Father, Son and Holy Spirit.” (Or other variations depending upon the liturgical season.) Also called the Salutation. Acolyte. An individual who assists with the ceremonial aspects of the liturgy, usually dressed in vestments. Acolytes may be any age or gender, ordained or not. In many parishes, they are often younger members of the congregation. Acolytes may be further divided into categories of service, e.g. torch bearer, crucifer, etc. Advent. The four Sundays before Christmas, foretelling and anticipating the Incarnation, Christ’s birth; this season is more preparatory than penitential. Alb. A long white vestment, traditionally starched linen as here at Ascension, with sleeves worn by the priest, deacon and sub-deacon at the celebration of the Holy Eucharist. Altar. The holy table set aside solely for the observance of the Communion/Lord’s Supper/Eucharist. The term “high altar” traditionally refers to altars near to or attached to the wall at the front of a church (hence the celebrant presides at the Eucharist with his or her back to the congregation), whereas the term “freestanding altar” is commonly used for those tables (such as we use for weekday and 9:00 a.m. Sunday masses at Ascension) where the priest faces the congregation from the back of the table. Amice. A cloth worn around the neck of the priest at the Mass — folded or ‘fluffed’ according to different schools of thought. It’s main purpose is practical, to prevent the alb from becoming soiled. Anglo-Catholic. The term refers to two aspects of our history and ongoing faith and worship. Anglican churches are those in the tradition of, and with ongoing ties to, the Church of England. (In the United States, we’re mainly called Episcopalians.) The ‘Catholic’ part of our identity is everywhere evident at the Church of the Ascension. We value and relish liturgy and music that engage and nourish the heart, the mind and all the senses. Our reverence for the sacrament of the Eucharist, the Mass, Christ’s Body and Blood, is emphasized by the architecture of the space and many elements of our worship. We have a strong sense of taking part, as Christ’s people, in the Communion of Saints, including Blessed Mary and our patron saint, Michael the Archangel. Our own living faith is inspired and sustained by remembering the lives and witness of those who are now eternally with God. Apocrypha. Writings mainly composed in the period between the Old and New Testaments. Included in the Bibles of Anglican, Roman Catholic and Orthodox (but not Protestant) Churches. In Anglicanism, generally understood as source of instruction but not doctrine. Aspergillium, Asperges. An Aspergillium is a hand-held vessel used for holding and sprinkling Holy Water. The name is derived from the Latin text of Psalm 51:7, Asperge me … (‘Thou shalt purge me …’ ). Asperges refers to the sprinkling of the People with Holy Water, at the beginning of the Solemn High Mass or on other occasions. ​Ascension. Commemorates Christ’s Ascension into Heaven, forty days after Easter and ten days before Pentecost. Also, a lovely, idiosyncratic Anglo-Catholic parish in Chicago’s Gold Coast, known for traditional catholic worship, sacred music and idiosyncratic, faithful members. View of the nave through the narthex doors. ​Baptismal Font. Baptism normally takes place at a Font specifically designed and designated for Baptism. As at Ascension, the Font is often placed near the church entry to signify that Baptism is the spiritual-sacramental means by which we enter into the Church. The elaborate carving on the cover of the font at Ascension includes eight angels bearing shields on which are named ‘gifts of the Spirit’ that are bestowed on God’s people through baptism — love, joy, peace, patience, gentleness, faithfulness, kindness and self-control. Fun fact: The Ascension font cover, attached to a steel cable and motorized winch, is lifted up into the chest of the pipe organ for Baptisms. Baptismal Covenant. The Sacrament of Baptism has long included a recitation, in question-and-answer form, of the ancient Apostles’ Creed. To this the 1979 Book of Common Prayer added five additional questions intended to distill the core commitments of the Christian life. Biretta. A square black cap with a decorative pompom worn by the clergy in some Liturgies. Book of Common Prayer. The standard of worship for Episcopalians, it includes not only the Eucharistic liturgies (primary worship services with Communion) prescribed for Sundays, but also the “Daily Offices” (Morning Prayer and Evening Prayer services); sacramental rites for baptism, confirmation, marriage, reconciliation, ordination, and burial; sections of special prayers and thanksgivings; the Psalter; a brief Catechism; and related “rubics” (instructions and guidelines). Book of Occasional Services (BOS). The title of a companion volume to the Prayer Book which includes special services such as a liturgy for healing, house blessings, seasonal blessings which may be used during the Eucharist, and more. Catechism. A short summary, or outline, of the Christian faith. Catechisms may be of varying authorship and length. A short catechism is included as part of the 1979 Book of Common Prayer, beginning on page 845. ​Celebrant. The priest who presides at any Mass. Chalice. 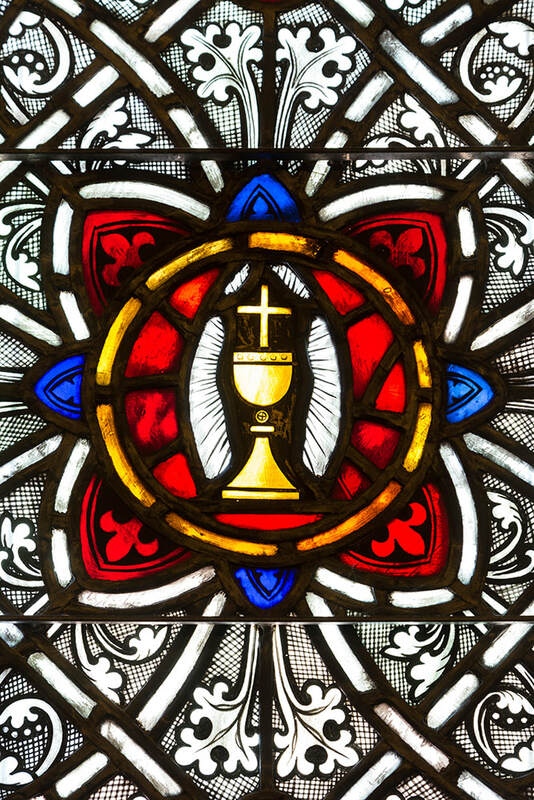 The cup in which wine is consecrated, becoming the Blood of Christ, and shared at the Communion, often made of precious metal(s) and adorned with special symbols, engraving, or precious stones. Chancel. Historically, the part of the church reserved for the ministry of the choir—distinguished from the ‘sanctuary,’ where the altar stood and which was only entered by those directly serving at the altar. Now the chancel often refers generally to the place in a church from which the ministers (including choir, if present) serve and preside. Chasuble – The top layer, colored vestment, often elaborate, signifying the priest who is presiding at the Eucharist. It may be worn for the entire Liturgy (as at weekday Masses here at Ascension) or only for the Canon of the Mass proper (as at Solemn High Mass here). Cut in many different shapes, lengths and styles. Christmas(tide) – the days from Christmas through Epiphany (January 6) inclusive, celebrating Christ’s birth and His manifestation to the Gentiles. Collect. A short prayer loosely following a three-fold pattern with 1) an invocation, 2) a petition, and 3) a pleading of Christ’s name or an ascription of glory to God. Historically, the collect referred specifically to the prayer in the Eucharist which immediately preceded the readings from the Bible. However, the term is now commonly used for any liturgical prayer from any of the Prayer Book services following this pattern. The name “COL-lect” (with emphasis on the first syllable) is intended to convey the “collecting” of the intentions of those gathered for worship into a single prayer, and many collects incorporate specific themes, for instance anticipating a message from the appointed Scriptures for the day, or drawing attention to the theme of a liturgical season or the virtue of a particular saint or the intention of a particular occasion (marriage, ordination, elections, national crises, etc.). A chalice depicted in one of the many beautiful stained glass windows at Church of the Ascension. White (or gold): symbolizing purity, victory and joy, used at Christmas, Easter, and other Feasts of our Lord, the feasts of saints other than martyrs, and other festal occasions such as baptism or marriage. Purple: symbolizing penitence and sorrow, worn during Lent and Advent, also worn by priests when hearing confessions. Red: symbolizing the Holy Spirit and blood, worn at Pentecost, at ordinations, and on feasts of Apostles or martyred saints. Green: symbolizing growth, worn during the “Ordinary” seasons – between Trinity Sunday and the First Sunday in Advent and between Epiphany and Ash Wednesday. Black: the color of mourning; worn for Requiem Masses and on Good Friday. Crimson/Oxblood: a deep dark red, combining the symbolism of blood with the darkness of sin, worn during Holy Week. Blue: the color associated with the Blessed Virgin Mary; in some places blue is worn during Advent. Rose: worn on the Third Sunday of Advent and the Fourth Sunday of Lent, days of “refreshment” in the midst of seasons of preparation and penitence. Concelebrant. A priest who joins the celebrant at the altar during the Communion and who specifically takes a part in the manual acts or in saying the words related to the words of institution. Confirmation. A rite by which one who has been previously baptized, usually as an infant or young child, makes an adult ‘confirmation’ of the Christian faith that was previously embraced on one’s behalf by one’s parents. Adults who convert to the Episcopal church are sometimes confirmed even if they have been previously confirmed in another Christian tradition (see Reception, below). ​Consecration. Another word for blessing or to convey the separation or setting aside of a thing or person for Divine service. It is narrowly used in the context of the Eucharist to invoke the imparting of the Holy Spirit to the gifts of bread and wine during the Communion. There are various theories as to how, when, where and the extent to which this happens. All Communion prayers in our Prayer Book include specific language along these lines (e.g. “Sanctify them by your Holy Spirit to be for your people the Body and Blood of your Son ...” Eucharistic Prayer A, Rite II, page 363.) The term consecration is also used to describe the entire service whereby a priest is ordained as a bishop, or the blessings of altars, churches, sacred vessels, etc. Cope. The cape-like vestment worn by the clergy in processions and certain other services. Corpus Christi. Latin for the Body of Christ. Also a feast that falls on the Thursday after Trinity Sunday, though often (as here at Ascension) celebrated the following Sunday. A celebration of the mystery of the Eucharist, traditionally including a procession with the Blessed Sacrament. Crucifer. One who carries the processional cross in any service of worship. Daily Office. Refers to the ancient traditions, predating Christianity, of offering prayers at set times of the day. Christian monastic traditions dating from the third and fourth centuries typically include seven ‘offices.’ Anglican prayer books, including our present one, include two primary daily offices, Morning Prayer and Evening Prayer. The 1979 BCP also includes a variety of additional services suitable for adaption by individuals or households. The term “daily office” is often used in general to refer to the entire practice of disciplined, daily liturgical prayers. Dalmatic and Tunicle. Vestments worn by the Deacon and Sub-Deacon at Solemn High Mass. Deacon. 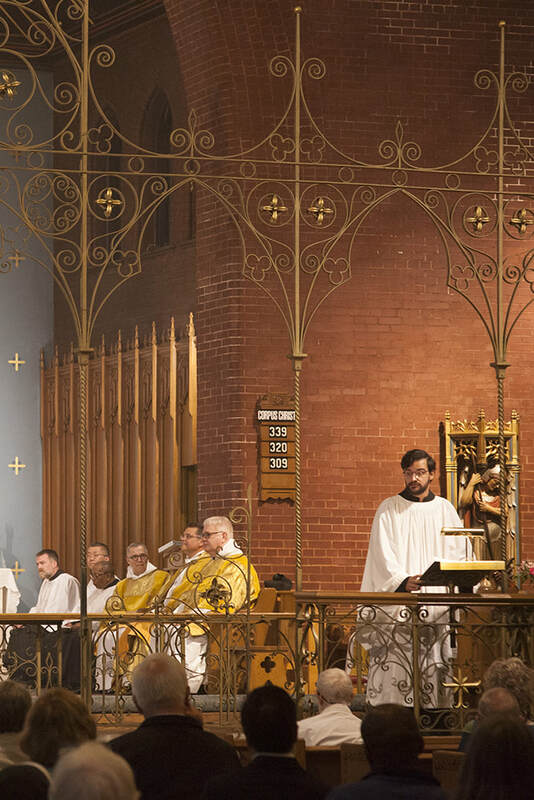 One of three ordained ministries in Anglican tradition, the deacon has specific authority and prerogatives for certain aspects of the liturgy, including reading of the Gospel, preparing the altar for Communion, and offering the Dismissal. Eastertide. The seven weeks of Easter celebration between Easter Day and Pentecost. Eucharist. Deriving from a biblical Greek word for thanksgiving, the word refers generally to the worship service that includes Communion, or it is sometimes used to refer only to the portion of the service devoted to the Communion (distinct from the Liturgy of the Word), or it is sometimes used even more narrowly to refer to the sacred elements of bread and wine. Font. A vessel filled with water for use in baptism. There is a very great diversity of forms of font, from simple to ornate, small to large. Some fonts are large enough for full immersion or adults. Some incorporate running water, and so forth. A font may serve a valuable role as a liturgical symbol in a worship space but is not intrinsic to the efficacy of the baptism proper. Gospel Book. A book, usually of larger and dignified printing, binding and finishing, containing the Gospel lessons appointed for the Eucharist and other special occasions. Genuflection. Reverence toward the consecrated sacrament in the form of lowering one’s self on one knee. In the Episcopal Church genuflection tends to be embraced and practiced by those of ‘high church’ leanings and otherwise avoided or eschewed. It is sometimes used by clergy during communion, most commonly at the end of the prayer of consecration. Some laity genuflect, when entering or leaving the pew in a church, either toward an altar with consecrated bread and wine or toward the tabernacle where the reserved sacrament is kept. Great Thanksgiving. The Communion service proper, technically consisting of the Sursum Corda, Preface, Sanctus et Benedictus (“Holy, Holy, Holy Lord ...”), Eucharistic Prayer (including the Words of Institution), concluding Doxology and Lord’s Prayer. Holy Water, Stoup. Water used in Baptism is first blessed in the context of the Rite, prior to the Baptism proper. Water is separately blessed and kept in a designated vessel in the Sacristy and is mainly used to fill the several Stoups at various entrances to the church. Here we may dip a finger in the water and cross ourselves, recalling our own Baptisms and renewing our commitment to the Baptismal Covenant. Holy Water is also traditionally used in other contexts for blessing objects, people or places and/or warding off evil. Holy Week. From Palm Sunday through Holy Saturday, commemorating Christ’s triumphal entry into Jerusalem, His Passion and Crucifixion. Host, Hosts. The unleavened wafer-like bread used in the Holy Eucharist and normally stamped with a cross. The Priest’s (or Celebrant’s) Host is a larger Host more conspicuously handled and shown by the priest in the Celebration of the Mass. Humeral veil. a large oblong fabric, usually ornate, used at Benediction and for processions of the Blessed Sacrament, worn draped over the officiant’s arms and shoulders and covering the hands so that skin does not directly touch the monstrance bearing the Host. Intercessor. One who reads the Prayers of the People or other prayers during public worship. ​Intinction. The practice by some of dipping the bread into the wine, rather than receiving the bread and wine separately. In our diocese, the bishop had indicated a preference that where intinction takes place, the priest or Eucharistic minister is to dip the bread in the wine and place it on the tongue of the Communicant. 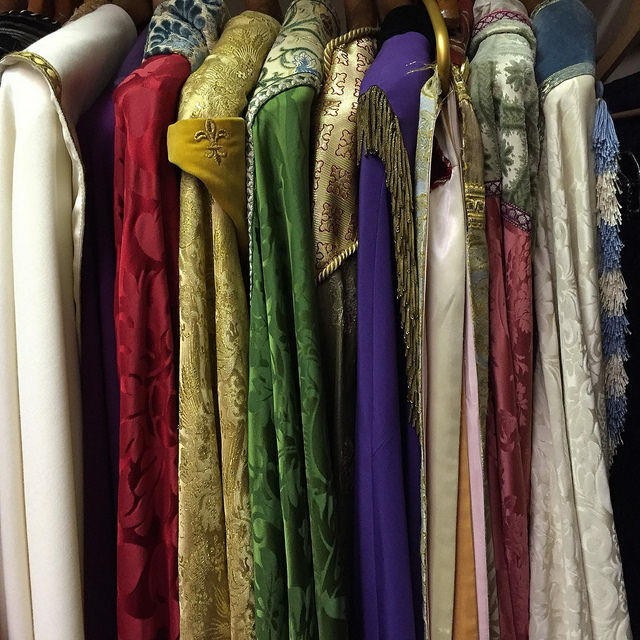 Church of the Ascension is steeped in tradition and meaning, including the symbolic colors of the vestments for our services. Lectionary. A schedule of appointed readings for public worship. Our present Prayer Book includes a three-year cycle of readings for Eucharists on Sundays (plus other occasions for which the Eucharist is normally celebrated), plus a separate two-year cycle of readings for the Daily Offices. Excellent rubrics regarding the Lectionary are found in the BCP, p. 888., and at p. 934. Lector. One who reads the Scripture publicly in the context of worship. Lent. Ash Wednesday to Holy Saturday, a period of penitence and self-discipline to prepare for the great feast of Easter; liturgical features include the omission of “Alleluia” and readings that emphasize humanity’s fallen nature. Lesser Feasts and Fasts. The title of a companion volume to the Prayer Book providing short biographies and collects for the observance of saints days and other occasions included in the calendar of the Episcopal Church. Litany. The word comes from a Greek term for ‘supplication’ and refers to any form of prayer consisting of a series of petitions or biddings which are sung or said and to which the congregation makes fixed responses. The terms sometimes refers to the Great Litany, BCP, p. 148, although the Prayer Book also includes several other litanies, for instance the Litany of Thanksgiving on p. 836. Liturgical colors. See Colors, Liturgical. Liturgy. In the broadest sense, the word refers to any matter having to do with the form or content of the public worship of the church. It is often used to describe only the form or content of the Eucharist. Liturgy of the Word. That portion of the service from the opening Acclamation through the Peace, worshiping Christ as Word through Scripture readings, the sermon, Creed, and Prayers. Lord’s Prayer. The prayer attributed to Jesus of Nazareth and included at one place or another in nearly every liturgy of the church. A lector reads the Scripture at this Corpus Christi mass at Ascension. Minister. All baptized Christians are ministers, although in reference to worship, the term typically refers either generally to any person who shares in leading worship or to the clergy. Missal. Also known as the Altar Book, the missal is used on the altar to provide all the resources required by the celebrant to preside at Communion. Monstrance. A vessel in which is placed a consecrated Host, to be the focus of meditation or adoration. Most often used here at Ascension in the liturgy of Benediction of the Blessed Sacrament and in procession on the Feast of Corpus Christi. Nave. The part of the church where the congregation gathers and worships, from Latin ‘navis,’ ship. The four Gospels, accounts of the life, ministry, Passion, death and resurrection of Jesus Christ - Matthew, Mark, Luke, John. The Acts of the Apostles - a history of the young Church and its missionary efforts. The Epistles - letters of instruction and doctrine by Peter, Paul, John and others to the young churches. The Revelation of John, or the Apocalypse - a visionary and symbolic writing. Oblationists. Those who, on behalf of all gathered, bring forward the gifts of bread and wine for the Mass. Officiant. One who presides at a public worship service. It may refer to the Celebrant at a Eucharist, or to a lay or ordained individual presiding at the daily office. Old Testament. The Hebrew Scriptures. The story of creation and of the fall of humanity through disobedience. The record of God’s plan to undo the fall, specifically through his dealings with His chosen people - the Jews. Ordinary Time after Pentecost. The period between Trinity Sunday and the first Sunday in Advent. Appointed Scripture lessons and preaching feature themes of faith, spiritual growth and mission in Christian life. Ordination. The tradition and ceremonies of laying on of hands by which individuals are set aside for the church’s ministries of bishop, priest, and deacon. Paschal Candle. The very large candle, often elaborately decorated, first lit annually at the Great Vigil and First Mass of Easter—and thus serving as a primary symbol of the Resurrection of Christ, the Light of the World. 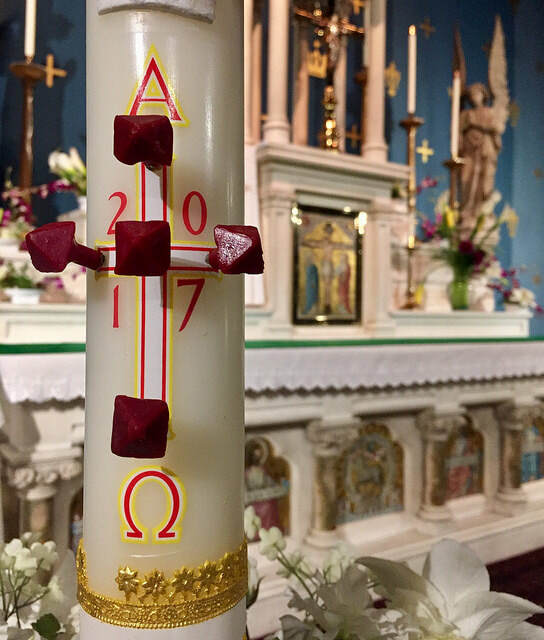 The Paschal Candle remains in the Sanctuary and is lit for all worship throughout the Fifty Days of Easter, as well as for funerals at anytime, and is otherwise placed near the Baptismal font. Paten, Ciborium. Vessels used for the bread (Body of Christ) at the Holy Eucharist. A Ciborium is a chalice-shaped vessel with a lid used both for the Communion of the People and for the Reserved Sacrament (see below)..
Peace. The exchanging of greetings, using the language of God’s peace, during the Eucharist. Pentecost. Celebrates the promised descent of the Holy Spirit upon the Apostles. In England, baptisms are traditionally celebrated on Pentecost, and there the day is widely known as Whitsunday, an allusion to infants’ white baptismal gowns. People. All who gather in faith to be spiritually nourished by Word and Sacrament and to share in the fellowship of Christ’s Body are referred to Liturgically as The People. The rubrics (directions) in the Book of Common Prayer routinely indicate active participation by the People in the Mass and other worship. Propers. A selection of readings appointed to be used together for a Eucharist, and normally consisting of a reading from the Hebrew Scriptures (Old Testament), a portion of the Psalter, a reading from the New Testament Epistles, and a Gospel reading. Candles are important symbols within our services, most often representing Christ as the Light of the World. Psalter. The entire Book of Psalms from the Hebrew Scriptures (Old Testament), reproduced in its entirety in the Prayer Book. Reaffirmation. A rite by which one who has been previously baptized and confirmed may make a renewed commitment to faith in Christ and ministry and witness in the Church. Reconciliation. The full name of the service is The Reconciliation of a Penitent. The rite of Confession and Absolution provided for in the Prayer Book. See pp. 447ff. Rector. The priest in charge of a parish. The call of a Rector is issued by the Vestry and confirmed by the diocesan Bishop. Reserve(d) Sacrament, Tabernacle, Sanctuary Lamp. Consecrated bread and wine (the Body and Blood of Christ) are kept in a Tabernacle (behind a door in the center of the Altar at Ascension) and are available to those unable to take part in the public celebration of the Mass. The Tabernacle also provides a focal point for prayer and adoration at any time. The candle in the Sanctuary Lamp (hung over the altar in the middle of the Sanctuary at Ascension) is always kept burning in proximity to the Reserved Sacrament to signify the presence of our Lord in the consecrated sacrament of His Body and Blood. Revelation. From “reveal” - the revealing or disclosing of God and God’s acts to humanity: general revelation - revelation accessible to all people, as the discerning of God’s presence in the beauty of nature; special revelation - revelation accessible to humankind only through a special means — as in the Canon of Scripture. Reverence. The word can refer to a solemn bow made by the priest at various times in the liturgy, or by anyone pausing and bowing to signify ‘reverence’ toward the altar, cross or sacrament; or, as is the custom of some, at any point when the name of Jesus is used at any point in the liturgy. Rubric. Rubrics are instructions for the liturgy that may be used to clarify actions to be taken, choices for the priest or people, disciplinary instructions, and so forth. The word comes from the word ‘ruby,’ because the original rubrics were printed in dark red ink. Sacred Ministers. The Celebrant, Deacon and Sub-Deacon at the celebration of Solemn High Mass, each with unique traditional roles. The Deacon may be an individual permanently ordained to the office or may be a Priest. The Sub-Deacon is normally a trained lay person. Sacristan. One whose ministry is in the sacristy, where the vessels, elements, vestments, books and records related to Mass and other worship are kept, administered and cared for. Sacristy. A place set aside for vessels or vestments or other accouterment related to worship and where preparations for worship take place. Sanctuary Lamp. See Reserved Sacrament. Sanctus Bell. A bell or bells rung at various times during the celebration of the Eucharist. Server. An informal term that normally refer to one who ‘serves’ at the altar as an acolyte. Sometimes used to refer to an adult who performs multiple functions as an assisting minister for a liturgy. Stole. The narrow colored scarf-like vestment worn by the ordained clergy. It is worn only at sacramental services and blessings. Its color varies with the season and the nature of the service being celebrated, as do the other vestments worn at the celebration of the Eucharist. A deacon’s stole may refer to a uniquely cut stole that naturally allows it to be worn over the left shoulder and gathered at the right hip (thus designating the wearer as a deacon) or may be any stole so worn. Surplice. The long white robe worn over the cassock. A shorter surplice, with the hem typically just above the knee, is sometimes called a cotta (from the Latin for ‘cut off’). Sursum Corda. From the Latin to ‘lift up the heart,’ this phrase refers to the opening exchange between the celebrant and people at the beginning of the Great Thanksgiving. Thurible. A vessel for burning incense, usually on a chain so that it may be moved about the church. ​Thurifer. A lay minister who carries the thurible, an incense pot. Torches. Candles, especially those mounted on ornamental poles for use in processions. Triduum. The “Great Three Days.” Maundy Thursday commemorates the Last Supper and Christ’s washing of His disciples’ feet, prior to his Passion. Good Friday observes Christ’s Crucifixion, death and burial with solemn prayers, the Passion according to St. John, and the Veneration of the Cross. Holy Saturday leads into the Great Vigil of Easter, the celebration of Christ’s resurrection. Trinity Sunday – the Sunday after Pentecost, given over to a celebration of the mystery that is the Holy Trinity. Ushers. 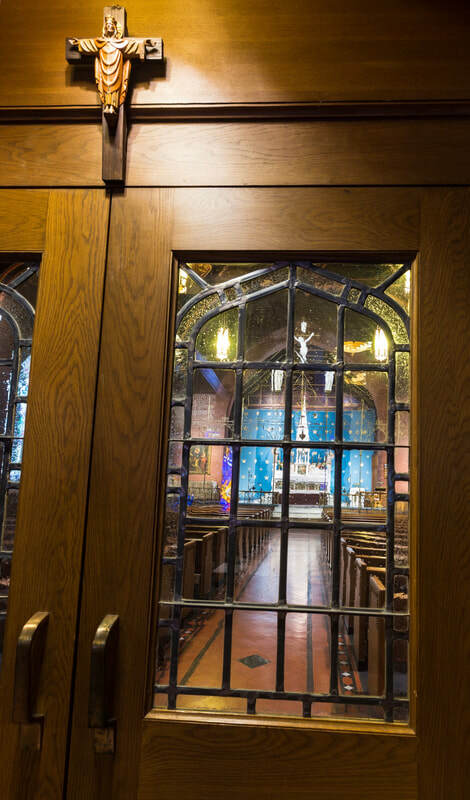 Those who welcome, offer assistance and direction and respond to needs in the nave, narthex or elsewhere as needed during the Mass —in addition to handing out bulletins. Versicle and Response. A short utterance, invocation or prayer, usually scriptural, uttered by an individual leading worship, and the response uttered by the congregation. Vestments. Special robes or other clothing worn by ministers, lay or ordained, and used to signify the station of the individual and/or liturgical symbolism and to enrich the atmosphere of worship. Definition from the Oxford English Dictionary: 1. A chasuble or other robe worn by the clergy or choristers during services … ‘a priest in green vestments came and preached a long sermon’ … 1.1 archaic A garment, especially a ceremonial or official robe. Origin Middle English: from Old French vestiment, from Latin vestimentum, from vestire ‘clothe’ (see vest). Vestry. Laypersons with fiduciary and other leadership responsibilities who are elected by the voting members of an Episcopal parish. Responsibilities include care and maintenance of the church facilities and the parish’s financial health and stewardship. In collaboration with the Rector, a Vestry also typically shares in strategic leadership relative to a congregation’s mission, ministries and priorities. The Rector leads and is also a voting member of a Vestry, although a Rector normally votes only to break a tie or to be included if necessary to form a quorum. Wardens. The Senior and Junior Warden serve as the president and vice-president of the Vestry and typically share with the Rector in preparing Vestry agendas and supporting the Vestry members in their individual and shared leadership. Words of Institution. The words used by Jesus to ‘institute’ the Christian sacrament of bread and wine, the Body of Christ and the Cup of Salvation. These words are incorporated into all forms of the Communion service found in the Prayer Book and form the heart of the Communion service. ​Zimbelstern. Included here in part in order to end with a ‘Z,’ this German word means "Cymbal Star" and here refers to a simple organ stop consisting of a small wheel on which bells are mounted. When engaged, the star rotates, producing a continuous tinkling sound. Alas, the zimbelstern in the Schrader Organ at Ascension is presently mounted out of view. 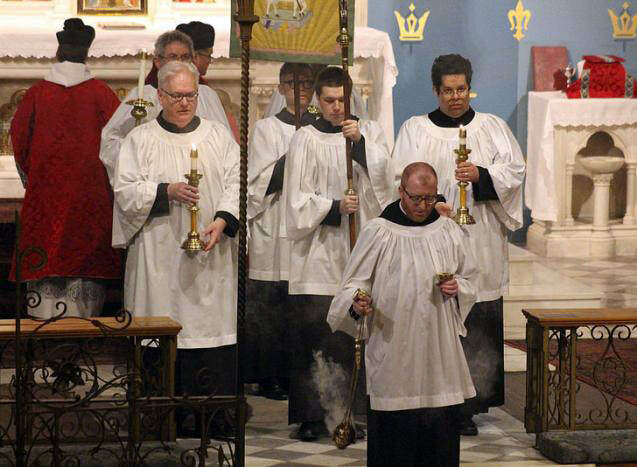 An acolyte carries a thurible, a vessel for burning incense, throughout the church.